The spacecraft and upper stage are housed within the payload fairing, which has a diameter of 2.9 meters (9.5 feet). 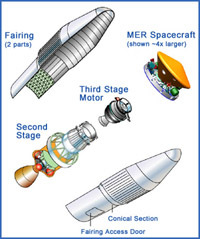 The payload fairing is the equipment used to protect the spacecraft and the third stage during the early portion of the boost phase when the aerodynamic forces from the atmosphere could affect the rocket. What are aerodynamic forces? If you've ever carefully placed your hand near the window of your car while it's traveling at highway speeds, you've felt strong aerodynamic forces pushing back against your hand. As the rocket quickly picks up speed, it experiences similar aerodynamic forces, only on the order of 1000 pounds per square foot. That's about the force that a flat dinner plate would feel in a 500 mph wind at sea level. With this extreme pressure, it's very important to have the fairing to protect the spacecraft inside. 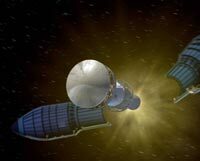 The fairing was jettisoned shortly after the ignition of Stage II at an altitude of approximately 130 kilometers (about 80 miles) above the Earth.